Transfer by coach from Dijon to Port-Sur-Saône. Passengers are welcome to board our ship at 6:00 p.m. After comfortably settling into your cabins, we'll introduce our crew at a welcome cocktail before dinner. This morning will be spent cruising towards Ray-sur-Saône. This is the perfect moment to relax and enjoy the hillside scenery and rolling meadows during our cruise In the afternoon, join us on an visit to the medieval castle at Champlitte which hosts the Museum of Popular Arts and Traditions. This morning will be spent cruising towards Gray. Take time to admire the spectacular scenery that we slowly pass by as we cruise. In the afternoon, join us on a guided tour of Gray. You'll discover the wonderful treasures of the town as you meander through its streets. The tour will end with a tasting* of some of the local specialties. 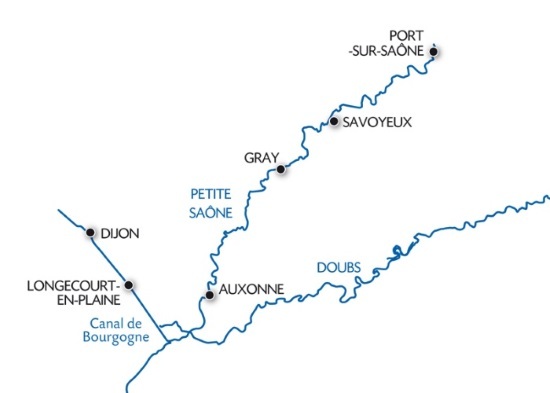 The whole day will be spent cruising towards Auxonne, arriving near the end of the afternoon. You can relax on the sun deck and admire the beautiful scenery. Bicycles are available on board at any time if you would like to take a bike ride along the canal's banks (1). This morning will be spent cruising. Admire the magnificent lush, green landscapes all along the river on our journey. In the afternoon, join us on an excursion along the Grands Crus Wine Route. The touristic Grands Crus wine route passes through villages and the finest and most prestigious of the Burgundy vineyards. We'll stop along the way for a wine-tasting* session. We'll return on board in Longecourt-en-Plaine. This morning will be spent cruising towards Dijon. In the afternoon, join us on a guided tour of Dijon. You will discover the former capital of the Valois Dukes of Burgundy and its wonderfully rich heritage. Tonight is our gala evening and dinner. Enjoy one last buffet breakfast on board before disembarking at 9:00 a.m. End of our services. From Port-sur-Saône to Dijon, cruise on the majestic Burgundy canal where charming cities and stories await you. Go back in time through our guided tours and discover Dijon, former capital of the Dukes of Burgundy, or the unparalleled elegance of the Château de Champlitte. Take a breath of fresh air and immerse yourself in arts, traditions and architectural gems through this journey across the Haute-Saône all the way to Burgundy. For the safety of our passengers, the captain and crew of the boat may decide to modify the navigational itinerary.